Chances are you’ve been imagining your quinceañera since you were a young girl. You’ve spent years thinking about what you want your tiara to look like, who you will ask to be on your Court of Honor, and what pair of heels you’ll put on during the Changing of the Shoes. Next to your wedding day, your quinceañera is one of the most important of your life. No pressure, right? Having a theme is one of the best ways to ensure that your quince goes smoothly and that all the small details come together to make for an incredible celebration. 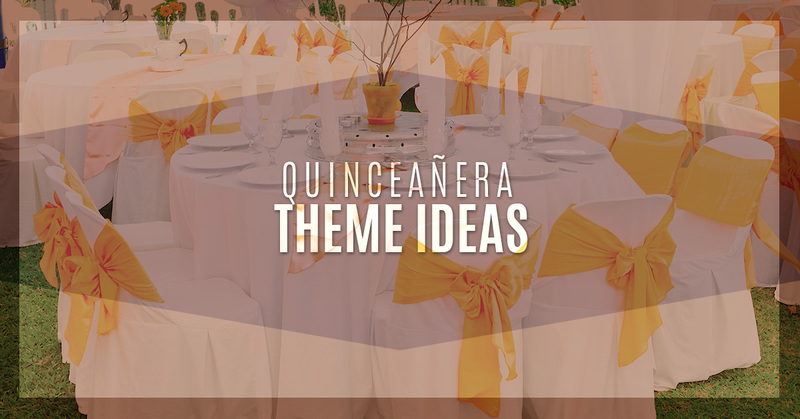 It can be hard to choose a theme that honors the tradition of a quince, recognizes your current interests and taste, and also fits within your budget. At Alegria Gardens, we have been helping young women and families host quinces for the last decade at our party venue in Katy. We wanted to offer some theme ideas that we have seen work very well. Have you always wanted to visit a foreign destination like Paris, Hawaii, or even Thailand? Think about the place you most want to go, and think about whether it would work with a theme. We have seen Paris-themed quinces work very well at our party venue because Paris is all about elegant and fashionable decor. You can definitely make a more tropical location work, but you want to make sure that your quince doesn’t turn into a tacky luau party. When you choose a place, think about its iconic colors (maybe from the flag or landscape), its famous landmarks, and its culture. Then, you can start to plan your details around the place! With this party theme, you and your guests will all don stylish masks characteristic of a masquerade ball. You can provide masks for your guests or have them decorate their own, depending on how formal you want the occasion to be. This theme works best with black, purple, and gold, so that masks and other decorations stand out. Your family and friends all have personality, and this is a great way for them to show it off! Plus, as a common party theme, you won’t have trouble finding appropriate decoration. Living in Texas means we never really get to experience full-on winter. Theming your quince to be a winter wonderland can be absolutely stunning — and a nice change of pace from our Texas heat. Your guests will feel like they are transported to a shining, shimmering snow globe. Your dress and Court of Honor outfits can also match this theme easily if they are silver, white, blue, or have sparkling elements. If you want to honor your Mexican heritage even more, a mariachi theme is the perfect way to do it. You can include a live mariachi band to energize your party venue. Additionally, your food can also relate to the theme by including traditional Mexican cuisine. This theme is a classic for a reason! You can’t go wrong with a mariachi party. This theme might seem a bit in the clouds, literally, but outer space is a neat and unconventional theme idea for your quince. You can easily include black decorates to give an outer-space feel, but you can also include sparkling elements to mimic stars, planets, and the moon. With a shiny dress, you will absolutely standout on your special day. As with any theme, you want to check that your party venue is appropriate. If a venue has all white walls and extremely bright lighting, a theme like outer space might not be your best bet. Do you envision your quinceañera to be a high-energy dance party? Having a glow in the dark theme is relatively easy and affordable, but it can look so cool. You can include glow sticks and bright lights for your table centerpieces, wear a bright neon dress (either green, pink, blue, or purple), and have a blast on the dance floor. Once you have your theme chosen, you want to make sure you have the perfect venue for your day. Contact our party venue in Katy today to learn more about our quinceañera packages which include catering, cake, limo services, DJ’s, and more depending on your needs. Contact us today for an unforgettable quince!